With Toffifay, you're always in good company. Launched in Germany in 1973, Toffifay was the world's first confectionery of its kind. Today Toffifay is enjoyed by people in more than one hundred countries. Toffifay is a combination that's perfect for every taste; a chewy caramel cup, a whole hazelnut, chocolate hazelnut filling and a drop of delicious chocolate. Unwrap something for yourself—my festive combination of hazelnut cream, chewy caramel and smooth chocolate. Is that mistletoe? Or are you just looking for a kiss of smooth chocolate and hazelnut cream? Toffifay is irresistible on so many levels! 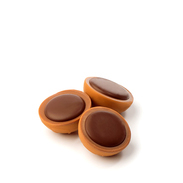 We spin chewy caramel into a little cup, drop in a whole hazelnut, cover it with chocolate hazelnut filling and top it with a drop of delicious chocolate. Toffifay is re-launched in the U.S. with a brand new package and positioning! The success story of Toffifay is ongoing. In 2014, Toffifay was already available in more than 100 countries. Numerous recipe ideas for cakes, muffins or just enjoyed pure and original as it is – Toffifay keeps on inspiring countless fans all over the world. Toffifay retained its uniqueness even in the new century. And it became increasingly popular abroad. The combination of four ingredients is a treat for the whole family. Toffifay makes a splash in the U.S.
Toffifay's "Too good for kids" TV campaign grabs the attention of adults who prefer a premium, multisensory treat. Black, brown and the hazelnut – this is how Toffifay started in Germany in 1973. What was intended as a little pick up me snack for working women soon grew. Toffifay gave Storck an original world class treat.